People need to be aware that when the cannabinoid, THC (Tetrahydrocannabinol) the psychoactive ingredient giving the ‘high’ in cannabis enters the brain, it sets in motion a chain of reactions that are inevitable, unpredictable, random and uncontrollable. The chemicals taking messages from neuron (brain cell) to neuron are called neurotransmitters. There are dozens of them each performing their own specific functions. The gap between neurons is called the synapse, neurotransmitters cross this gap and fit into receptor sites by shape on the next cell. THC mimics one of our most abundant neurotransmitters called anandamide. It is an endo-cannabinoid (produced in the body). Both occupy the same cannabinoid receptor sites, but THC will be present in much greater quantities. Anandamide regulates how active neurons are, and how much neurotransmitter they release. This acts as a sort of ‘dimmer’ switch, slowing down communication between cells and keeping all the circulating chemicals on an even keel and in balance (homeostasis). Levels of the neurotransmitters, dopamine, serotonin, endorphins etc for pleasure, mood, appetite, motivation, body movement, cognition, concentration. memory, brain development etc are all kept in balance by anandamide. But THC is much stronger and persistent. Being foreign to the body it has no enzymes to break it down, it is fat-soluble so remains in the fatty brain cells, around 50% for a week, 10% for a month, with traces for weeks afterwards, all the time giving out signals and interfering with total brain functioning. Even one joint/month will ensure a permanent presence of THC, and as Professor Sir Robin Murray says, ‘users will be in a state of low grade intoxication most of the time’. Anandamide is overwhelmed - the whole brain chemical signalling system is thrown into chaos. And the general excitability of the brain’s neural networks is greatly reduced. THC content of herbal cannabis through the 1960s and 70s was 1-2%. Skunk had a THC content averaging 16.2%, ranging to 46% in the last Home Office Potency Study in 2008. At that time, 80% of the cannabis seized was “skunk”, the other 20% mostly hash (resin) around 4-6% THC. Skunk is now the only type of cannabis available in London. The Dutch view cannabis with 15% or more THC to be a class ‘A’ drug. “Old-fashioned” herbal cannabis had similar amounts of THC and anti-psychotic CBD (Cannabidiol) which counteracted some of the effects of THC, but today’s skunk averages only 0.1% CBD. The hippocampus in the brain, the area most closely associated with memory, has an abundance of cannabinoid receptors. THC reduces hippocampus neuron activity below the level needed for memory formation. Neuron connections are gradually lost. Regular users have smaller hippocampuses, attention deficits, impaired learning and poorer memories. Academic performance plummets. IQ points are lost, almost certainly permanently. School dropout is fairly common. Few children using cannabis even occasionally will achieve their full potential. As chaos ensues among the confused brain messages, a cannabis personality develops. Users can’t think logically. They have fixed opinions and answers, can’t find words, can’t take criticism - it’s always someone else’s fault, and can’t plan their day. Families suffer from their violent mood swings - houses get trashed. Anxiety, panic and paranoia may ensue. At the same time users are lonely, miserable and feel misunderstood. Regular cannabis users have worse jobs, less than average money, downward social mobility, relationship problems and antisocial behaviour. Endo-cannabinoid signalling is crucial in brain development. It guides neural stem cell survival and proliferation, cell fate decisions and motility and differentiation of ensuing neuronal cells. THC negatively impacts if and how the structural platform and conduit for communication between nerve cells, the synapses and axons (nerve fibres), will develop and function. In infants, birth weight is lower and they may be born addicted. Children may have problems with behaviour and cognitive functions as they grow. Some childhood cancers are more common. Intensive care for newborns doubles. A low level of anandamide in the uterus is needed for the implantation of the embryo and a surge of THC would prevent this. The younger users start using cannabis, the more likely they are to remain immature, become addicted, suffer from mental illnesses or progress to other drugs. Depression has been widely seen in cannabis users. Marijuana causes a burst in the release of serotonin (the happiness neurotransmitter) by the neurons, resulting in an initially elevated euphoric mood. However, once the initial feeling of euphoria fades, serotonin levels drop lower than they were originally, a significant serotonin depletion. Depression can and does sometimes lead to suicide. Cannabis use has been associated with this tragic outcome. Brain scans have shown shrinkage in several brain areas, and just recently a paper found that skunk harms key neurons linking the 2 halves of the brain, lesions appear, badly affecting communication. Driving is affected, the accident risk doubles. Over 24 hours after smoking a joint, airline pilots, trying to “land” on flight simulators were making mistakes and thought they were fine. Reaction times are increased. An average 20mg joint is thought to have the same effect as being just over the drink-drive limit. Alcohol impairs the loco-motor functioning while cannabis impairs cognitive abilities. Alcohol + cannabis in drivers is 16 times more dangerous. Physical dependence occurs because THC replaces anandamide. The production of anandamide gradually reduces. If a person then stops taking cannabis, the receptor sites are left unoccupied. Withdrawal sets in - irritability, sleeplessness, anxiety, depression, even violence. It takes time for anandamide to resume production. One in nine users will become addicted, with adolescents it rises to one in six. Withdrawal from cannabis is not so dramatic as that from heroin as THC remains for such a long time in the brain. Heroin addicts need a fix about every 4 hours. Adolescent cannabis addiction, rehab specialists have told us, is the hardest to treat. Research just in – 43% of skunk smokers will become addicted. In smokers of other types it’s 22%. 13,454 under 18s, including 183 aged 13 or under were treated for cannabis problems in 2014/5 – a rise of nearly 50% in 8 years, almost certainly due to the increased strength of THC. The number treated for alcohol addiction was 3133. (Public Health England NDTMS Report). The average age of first use of cannabis is 13. Cannabis ‘primes’ the brain for the use of other drugs. Swedish research showed that after training rats to self-administer heroin by pushing a lever, rats exposed to THC took more heroin than those not previously exposed to it. Fergusson (NZ) in his longitudinal studies from birth found, “the use of cannabis in late adolescence and early adulthood emerged as the strongest risk factor for later involvement in other illicit drug use”. Cannabinoid receptors are found throughout the human body, but are most prominent in the brain and spinal cord. It has been shown that when cannabinoids bind to the receptors in nerve and brain cells, they are able to alter the way these cells perceive painful stimuli, ultimately reducing the intensity of pain that is interpreted by the brain. THC has also been seen to reduce pain. There are cannabinoid receptors in the hypothalamus, a region of the brain known to regulate appetite. Endo-cannabinoids in this area send ‘I’m hungry’ messages to them. When you ingest THC, the amount of cannabinoids sending that message is boosted. This is generally called ‘the munchies’. The medicine Nabilone (synthetic THC) can be used to stimulate the appetite in AIDS patients. Paradoxically THC increases the release of dopamine, the ‘pleasure’ neurotransmitter. However the mechanism is still impairment rather than stimulation of neurons. Dopamine neurons have no cannabinoid receptors but GABA neurons (inhibitory) do. THC stops GABA from inhibiting the carefully balanced release of dopamine and so dopamine floods the brain. An increase of dopamine cause a surge of euphoria (the ‘high’), but excess can cause psychosis in anyone, and schizophrenia if there is a family history. Smoking cannabis before the age of 15 increases the risk fourfold of developing psychotic illnesses. Skunk users are almost 7 times more at risk than hash users. Excess dopamine is found in the brains of psychotics and schizophrenics. Aggression, violence, even homicides and suicides have resulted from cannabis-induced psychosis. The first published account of a link between cannabis and psychosis was in 1845! Cannabis smoke has many of the same constituents as tobacco but more of its carcinogens - in cancer terms a joint equals 4/5 cigarettes. More tar is deposited in the lungs and airways. Coughing, wheezing, emphysema, bronchitis and cancer have been seen in the lungs. Heart rates rise and stay high for 3-4 hours after a joint. Heart attacks and strokes have been recorded. Some teenagers had strokes and died after bingeing on cannabis. THC inhibits the vomiting reflex. Nabilone is used as an anti-emetic, e.g. to combat nausea in cancer chemotherapy. However, if a person has had too much alcohol, often they are sick and expel much of it, preventing overdose and death. But using cannabis simultaneously can be fatal. THC affects the DNA in new cells being made in the body. It speeds up the programmed cell death (apoptosis) of our defence white blood cells, so disease susceptibility rises. There are fewer sperm. Infertility and impotence have been reported. That apoptosis can occur in these cells has been known since the 1990s (Nahas). Now, an Australian paper published in July 2016 has shown that THC can disrupt the actual process of normal cell division in growth etc (mitosis), and meiosis (formation of sperm and eggs). Chromosomes are not properly segregated, the structures (microtubules) that pull them apart cannot form properly. Apoptosis is one of the consequences. Chromosomes can become isolated, rejoin other bits of chromosome and have other abnormalities. Some will actually be shattered into fragments (chromothripsis). Cannabis has been shown to greatly increase the rate of zygote (fertilised egg) death after the first division by 50%. Mitochondria (structures providing the cell’s energy) are inhibited by cannabis. The demonstration of sperm mitochondrial functional impairment is similarly of great concern as it implies increased errors in meiosis with the potential for transmission to subsequent generations. This DNA damage can also cause cancers. Oncogenes (cancer-causing genes) may be activated, and tumour suppressant genes silenced. Chromosome fragments and abnormal chromosomes are frequently seen in malignant tissues. This would account for the various other cancers reported in cannabis users that are not exposed to the smoke. Head, neck, larynx, leukaemia, brain, prostrate, cervix, testes and bladder cancers have all been associated with cannabis use. Pregnant users have been associated with an increase in the number of childhood cancers in their offspring. The relative risk of such tumours is usually found to be 2-6 fold increased. In several cases a dose-related response has been shown. Cannabis has also been associated with foetal abnormalities - low birth weight, pre-term birth, spontaneous miscarriage, spina bifida, anencephaly (absence of brain parts), cardiac defects and short or truncated forelimbs. All these defects bear in common an arrest of cell growth and cell migration at critical development stages consistent with the inhibition of mitosis noted with cannabis. CANNABIS: A General Survey of its Harmful Effects updated 2016 (Mary Brett). Chromothripsis and epigenomics complete causality criteria for cannabis- and addiction-connected carcinogenicity, congenital toxicity and heritable genotoxicity. Albert Stuart Reece, Gary Kenneth Hulse (School of Psychiatry and Clinical Neurosciences, University of Western Australia, Crawley WA 6009, Australia). 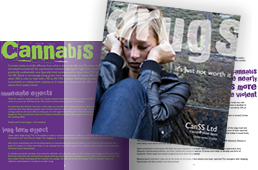 Our 35-page book gives clear and easy to read facts and advice aimed at teenagers and young people.